In this July 10, 2018, file photo, bottles of medicine ride on a belt at the Express Scripts mail-in pharmacy warehouse, in Florence, N.J. 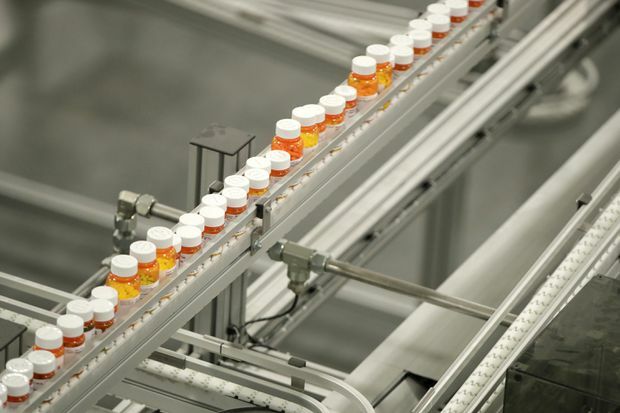 But as Democrats in Congress consider whether to back a revamped regional trade pact being pushed by U.S. President Donald Trump, they’re zeroing in on a new point of conflict: Drug prices. They contend that the new pact would force Americans to pay more for prescription drugs, and their argument has dimmed the outlook for one of Mr. Trump’s signature causes. The President’s proposed replacement for the 25-year-old North American free-trade agreement is meant to win over Democrats by incentivizing factories to hire and expand in the United States. Yet the pact would also give pharmaceutical companies 10 years’ protection from cheaper competition in a category of ultraexpensive drugs called biologics, which are made from living cells. The objections of Ms. DeLauro and other Democrats suddenly carry greater potency. The need to curb high drug prices has become a rallying cry for voters of all political stripes. Mr. Trump himself has joined the outcry. The revamped North America trade deal must be approved by both chambers of Congress, and Democrats have just regained control of the House. Representative Earl Blumenauer of Oregon, the new chairman of the House Ways and Means subcommittee on trade, told the Associated Press that “I don’t think candidly that it passes out of my trade subcommittee” with the biologics provision intact. “The biologics are some of the most expensive drugs on the planet,” Mr. Blumenauer said. Still, the politics of NAFTA 2.0 are tricky for Democrats and not necessarily a surefire winner for them. The original NAFTA, which took effect in 1994, tore down most trade barriers separating the United States, Canada and Mexico. Like Mr. Trump, many Democrats blamed NAFTA for encouraging American factories to abandon the United States to capitalize on lower-wage Mexican labour and then to ship goods back into the United States duty-free. Having long vilified NAFTA, Mr. Trump demanded a new deal – one far more favourable to the United States and its workers. For more than a year, his top negotiator, Robert Lighthizer, held talks with Canada and Mexico. Mr. Lighthizer managed to insert into the new pact provisions designed to appeal to Democrats and their allies in organized labour. For example, 40 per cent of cars would eventually have to be made in countries that pay autoworkers at least US$16 an hour – that is, in the United States and Canada and not in Mexico – to qualify for duty-free treatment. The question now is: Are Democrats prepared to support a deal that addresses some of their key objections to NAFTA and thereby hand Mr. Trump a political victory? Some Democrats have praised the new provisions that address auto wages, though many say they must be strengthened before they’d vote for the USMCA. Protection for drug companies is another matter. Many Democrats had protested even when the Obama administration negotiated eight years of protection for biologics – from cheap copycat competitors called “biosimilars” – in a 12-country Pacific Rim trade pact called the Trans-Pacific Partnership, or TPP. Mr. Trump abandoned the TPP in his first week in office. But the pharmaceutical industry is a potent lobby in Washington, and Mr. Trump’s negotiators pressed for protection for U.S. biologics in the new North American free-trade deal. They ended up granting the drug companies two additional years of protection in the pact. Mr. Greenberg said he was “shocked” by the intensity of their hostility to drug companies – and to the idea that a trade pact would shield those companies from competition. “It was like throwing a bomb into the focus group,” said Mr. Greenberg, who is married to Ms. DeLauro. He said the voters’ consensus view was essentially: “The President was supposed to go and renegotiate (NAFTA) so that it worked for American workers. But it must be that these lobbyists are working behind the scenes” to sneak in special-interest provisions.